Link the gap between your VirtueMart Store and Customer Support Service of your VirtueMart Customers. Now, you can furnish close attention to each and every customer's query coming from your VirtueMart Store and resolve their issue in the less amount of time. Confirm the order details fetching from VirtueMart Account on the ticket for the proper validation and avoid bogus queries. 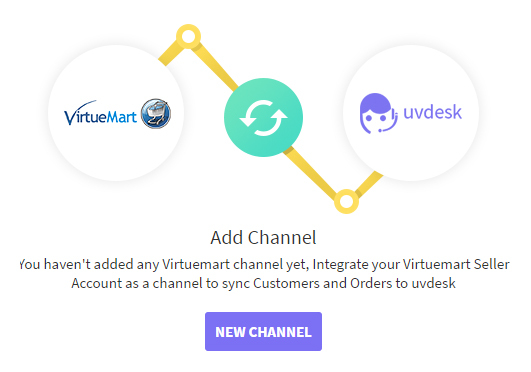 With the help of VirtueMart App, the support staff can see the order related details on the UVdesk which will be fetched from the VirtueMart Store. Login to your UVdesk Support Panel. On the Dashboard, you will see "APP CENTRE" menu and under it, you will find "VirtueMart". You will see four tabs- Overview, Screenshots, Documentation & Configure (after app installation). In the "Overview" section, you will see Install button. Click on that button and VirtueMart App will get installed. Alternately, for uninstalling the app, go to VirtueMart "Overview" section then click on Uninstall button. 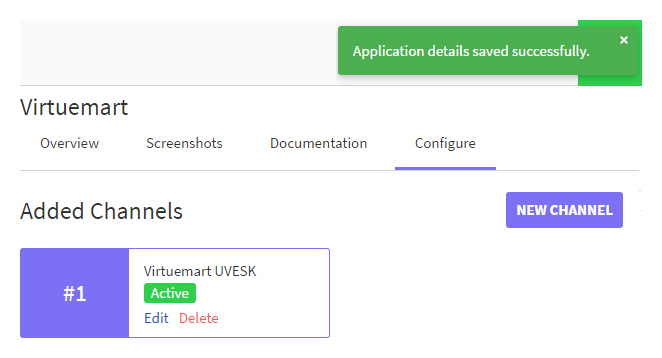 Now go to the "Configure" tab and click on "New Channel" to add new VirtueMart Channel in the UVdesk. For adding the channel, enter Name, Store Url and API Key. Follow the steps on the panel for generating your configuration details. 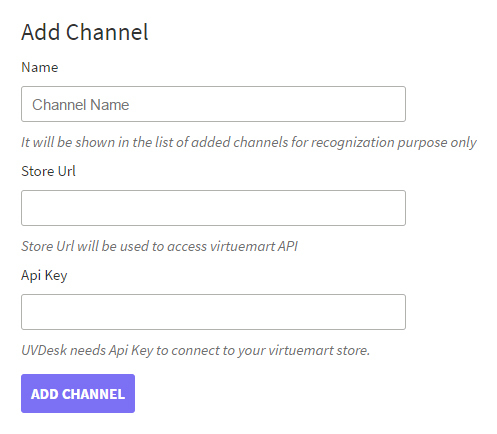 Copy API Key from Table, and any URL from Help Document on the same page for adding VirtueMart Channel in the UVdesk. After the successful configuration, you will see a success message on the UVdesk. 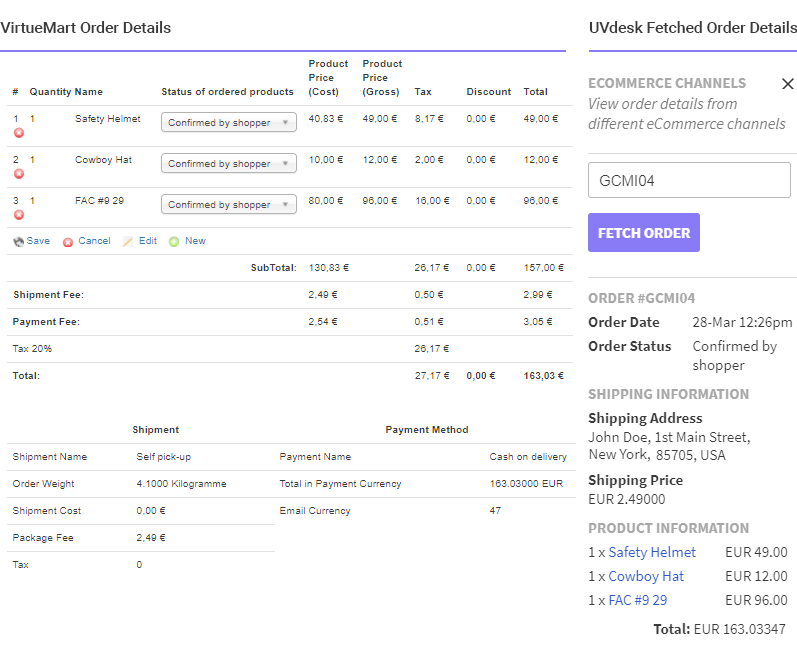 Now, on the ticket system, the support staff can enter the Order ID and select the platform or the Marketplace and then click on Fetch Order. After clicking the "Fetch Order" button, details related to the entered Order Id will be displayed on the ticket system to the support staff. In the case of any doubt, please email us at support@uvdesk.com You may also check other Marketplace set-ups with Uvdesk here.